Online casino operators are failing to protect problem gamblers or prevent money laundering, the Gambling Commission has warned. It has written to all 195 UK operators and warned them to review procedures. Many were unable to spot signs of financial crime and compulsive gambling, it said. It is investigating 17 companies, with five under licence review. If a company loses its licence, it would no longer be able to operate in the UK. None of the operators under investigation has been named by the regulator. Online gambling: What's the catch? 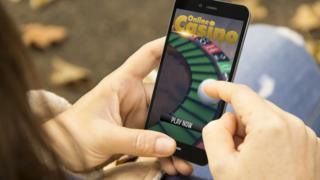 A third of all gambling in the UK now takes place online, and the industry is worth billions of pounds. But the commission is concerned that customers whose gambling is becoming compulsive are not being followed up. It reviewed a large number of customer accounts and found "potential signs of problem gambling based on consumers' gambling pattern and spend", it said. "In many cases, however, this behaviour did not trigger a customer interaction." David Bradford's family only discovered his secret gambling addiction when he was jailed for a £50,000 fraud. The accountant received an eight-month sentence in 2014 and his stunned family discovered the secret gambler was almost £500,000 in debt. He had also taken out payday loans and remortgaged the family home in Sheffield. Mr Bradford, now 61, said that rather than helping gamblers who were trying to stop, casinos sent "lots of offers to get back on the bandwagon". He added: "They only really answer to their shareholders … there is a need for a duty of care." His son Adam Bradford said gambling should be treated as a mental illness. The 25-year-old added: "I hope this measure is not simply a threat and if companies do lose their licences for breaches of the code, then it is a step in the right direction." The commission also said that some staff had little idea of how to spot money laundering - or, in some cases, even what it was. All companies should ensure staff are trained in the law, and they should all carry out risk assessments - such as monitoring and risk profiling of customers - it said. The commission's chief executive Sarah Harrison said the organisation was taking action to make the market "fairer and safer". She added: "It is vital that the gambling industry takes its duty to protect consumers and keep crime out of gambling."